Leukodystrophies are deadly neurodegenerative diseases that affect one in 7,000 children and remain incurable. These genetic diseases attack myelin or the “insulating rubber sheath” surrounding neurons, which leads to deteriorating health for affected children. Today, nearly 20 types of leukodystrophies have been characterized, but many other forms remain undefined, leaving nearly 40 per cent of families awaiting a diagnosis. An international research team, led by Dr. Geneviève Bernard from the Research Institute of the McGill University Health Centre (RI-MUHC) and Dr. Benoit Coulombe from the Institut de recherches cliniques de Montréal (IRCM), has identified a new gene associated with 4H leukodystrophy, one of the common forms of the disease. Their findings have been published in Nature Communications this week. H: MRI of the brain (axial view) of a child with leukodystrophy : myelin deficiency in the brain is characterized by signal abnormality, in other terms, white matter is white instead of almost black (see K for comparison). K: MRI of the brain (axial view) of healthy child: gray matter is pale gray and white matter almost black. “The ability to diagnose this rare and incurable disease has an enormous impact on families, as it helps them better prepare for what lies ahead,” explains Dr. Bernard. This is the case for the family of Xavier, 8 years old, who was diagnosed with leukodystrophy in 2013. Since then, his family who lives in Outaouais, visits Dr. Bernard at the MCH-MUHC every three months. 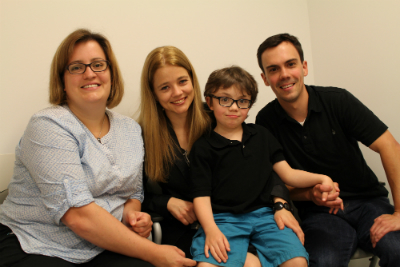 “Even if we currently lack information to help our son, the research conducted by Dr. Bernard and her colleagues is very important to understand the causes of the disease and to find future treatments to help children with leukodystrophy,” says Xavier’s mother, Mrs. Émilie Lapointe. According to Dr. Coulombe, an important step has been taken, not only by identifying a new gene causing leukodystrophy, but also by shedding light on the molecular mechanism that allows these gene mutations to cause harm. “Understanding the mechanisms that affect the biogenesis of RNA polymerase III will now guide our efforts in the development of new diagnostic tools to better predict the evolution and severity of the disease, and new therapeutic tools to help sick children,” add Drs. Bernard and Coulombe. The project was funded by the Canadian Institutes of Health Research and Dr. Coulombe’s Bell-Bombardier Chair of Excellence (IRCM). Dr. Bernard is a FRQS Chercheur-boursier clinicien Junior 1. The article Recessive mutations in POLR1C cause a leukodystrophy by impairing biogenesis of RNA polymerase III is available online on the Nature Communications website.